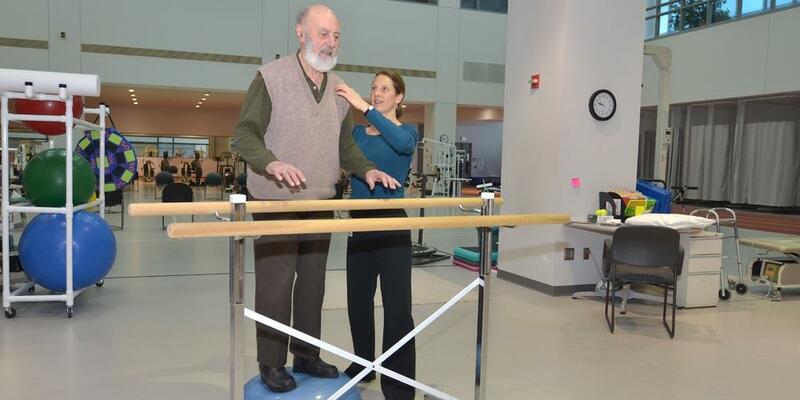 The Balance and Falls program is a comprehensive program designed to assess and treat patient with balance and fall issues. The program includes physical therapy for exercise, posture, and safety education. Occupational therapy services may be indicated for additional adaptive equipment needs. Individuals with a history of falls and gait disturbances including those with osteoporosis, back pain, neuropathy, post hip and knee replacements, generalized weakness, and neurological disorders will benefit from this program. A complete evaluation will be conducted during the initial visit. This evaluation may include a variety of tests to measure your strength, endurance, gait speed, balance, and joint movement. In addition to testing, a detailed history of your lifestyle, activity level, and home environment is conducted to help provide appropriate treatment. A supervised exercise program, specific to your individual needs will be conducted. Strengthening and flexibility, coordination, balance and agility exercises, and core strengthening exercises on specialized equipment will enhance your therapy goals. You will receive detailed diagrams of exercises, proper body mechanics, and safety and fall prevention techniques for your home program. The goal of the program is to decrease the risk of falls, increase activity level, and improve safety awareness. Wear loose clothing (slacks are recommended to allow ease with exercise and movement). There are balance specialists at all locations.